The pulmonary veins are the veins that transfer oxygenated blood from the lungs to the heart. The largest pulmonary veins are the four main pulmonary veins, two from each lung that drain into the left atrium of the heart. The pulmonary veins are part of the pulmonary circulation. Anterior (frontal) view of the opened heart. White arrows indicate normal blood flow. 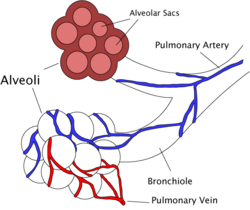 Diagram of the alveoli with both cross-section and external view. Two main pulmonary veins emerge from each lung hilum, receiving blood from three or four bronchial veins apiece and draining into the left atrium. 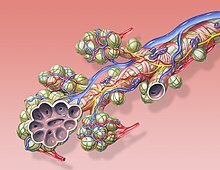 An inferior and superior main vein drains each lung, so there are four main veins in total. At the root of the lung, the right superior pulmonary vein lies in front of and a little below the pulmonary artery; the inferior is situated at the lowest part of the lung hilum. Behind the pulmonary artery is the bronchus. The right main pulmonary veins (contains oxygenated blood) pass behind the right atrium and superior vena cava; the left in front of the descending thoracic aorta. Occasionally the three lobar veins on the right side remain separate, and not infrequently the two left lobar veins end by a common opening into the left atrium. 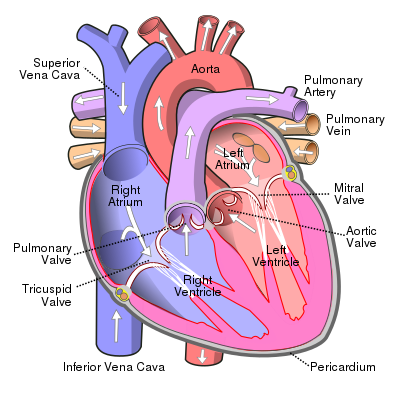 Therefore, the number of pulmonary veins opening into the left atrium can vary between three and five in the healthy population. The two left lobar veins may be united as a single pulmonary vein in about 25% of people; the two right veins may be united in about 3%. The pulmonary veins play an essential role in respiration, by receiving blood that has been oxygenated in the alveoli and returning it to the left atrium. As part of the pulmonary circulation they carry oxygenated blood back to the heart, as opposed to the veins of the systemic circulation which carry deoxygenated blood. A rare genetic defect of the pulmonary veins can cause them to drain into the pulmonary circulation in whole or in part, this is known as a total anomalous pulmonary venous connection (or drainage), or partial anomalous pulmonary connection, respectively. Computed tomography of a normal lung, with different levels of pulmonary veins. Transverse section of thorax, showing relations of pulmonary artery. Pulmonary vessels, seen in a dorsal view of the heart and lungs. ^ Drake, Richard L.; Vogl, Wayne; Tibbitts, Adam W.M. Mitchell; illustrations by Richard; Richardson, Paul (2005). Gray's anatomy for students (Pbk. ed.). Philadelphia: Elsevier/Churchill Livingstone. ISBN 978-0-443-06612-2.